Mark Ruffalo speaks onstage at The People's State Of The Union event at Townhall in New York City on Monday, Jan. 29, 2018. Celebrities and activists have taken part in an evening of speeches and music in Manhattan billed as "The People's State of the Union." Monday's event was planned in response to President Donald Trump's first State of the Union address on Tuesday. It was held at The Town Hall, a historic venue founded as a meeting spot for suffragists more than 90 years ago. 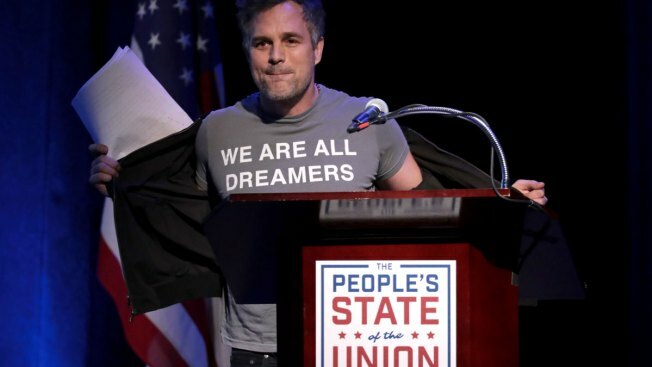 Speakers included Mark Ruffalo, Kathy Najimy, John Leguizamo and Democratic New York City Mayor Bill de Blasio Andra Day and Common sang their Grammy- and Oscar-nominated song "Stand Up for Something" from the film "Marshall." Hosts of the event included unions, organizers of the Women's March and Planned Parenthood.